There are so many benefits to choosing a Vertical blind for your window like the wide range of special finishes and fabric types that make Vertical Blinds an obvious choice for any busy home. A Vertical blind is made up of individual louvres or slats that clip on to a sliding track at the top and are joined together by weights and stabilising chains at the foot of the blind. Each slat hangs vertically and the entire blind is operated by a chain and a separate cord. The chain control is used to tilt and turn the slats while the cord control opens and closes the blind. Vertical blinds are available in a range of fabrics, colours and patterns to suit a wide variety of environments and interior styles. Because Vertical blinds are made up of individual louvres, there is virtually no limit to how wide they can be made so these blinds are ideal for large windows and patio doors that are too big to accommodate other blind types. Vertical blinds are also perfect for curved and square bay windows as well as other challenging spaces including sloping and split drop windows. 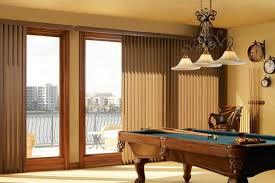 This is because the individual louvres can be cut to different lengths to perfectly fit the pitch of your window. 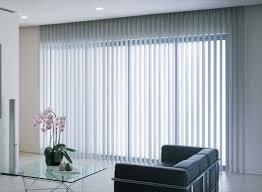 Because they hang vertically, Vertical Blinds collect less dust, making them easier to maintain. 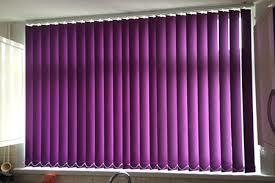 But when they do need to be cleaned, start by closing the blinds so you can see each slat. Dust them with a damp cloth and a little soap or vinegar or use your vacuum’s hose with a brush attachment to remove dust. Be sure to vacuum the track since accumulations of dust can cause it to work less efficiently. When you’ve done one side, turn the blinds to the other side and repeat the process. Contact DC Shutters for Vertical Blinds in Brampton, Toronto, Oshawa, Whitby, Oakville, Kitchener, Waterloo, Hamilton, Niagara, Toronto, Richmond Hill, Aurora, Newmarket, Ajax ON.